Many of my blog buddies are posting retrospectives of 2013, and their bicycling goals for 2014. Normally, I don’t engage is such milestone rituals. Instead, I just sort of ooze from one year to the next, flowing from one thing I find fun to do into another. But this is different. Since I have decided to focus intently on a single major event this year, public announcement seems essential. This event will require more preparation than any event I have ever done (and it might surprise astonish most of my readers that I have actually done some racing in my younger days). I’ll be honest and mention from the outset that the event intimidates me. It will require planning. It will require the acquistion of new gear, a new kit, and the development of new skills. It will major modifications to one of my bikes, and solving major logistics challenges. It will require extensive training. Because this is a major commitment for me, I have hesitated until now to make my decision public, but my preparations actually began intently in the fall of 2013. I have made considerable progress, and now believe this event to be doable. I’m sure you’ve guessed by now that my number one bicycle event focus for the year is… the Lake Pepin 3 Speed Tour on May 17-18. Even though I’ve worked out a few things, I have so many challenges still in front of me. Whatever will I wear? Where to all those tweed duds come from anyway? How do I properly hold a teacup? Will I actually be able to eat some kind of pastry or pie at every stop? And perhaps, most importantly, can I avoid buying a special bicycle for this event and use one of my current options? I’ve been told that using one of my bikes is acceptable. Apparently, having a 3-speed is more important that having a vintage bike. So I’ve been working on putting my beloved Quickbeam into a British 3-speed roadster costume. Things are going fairly well, and I’ll follow up with some photos and a brief description in the near future. Oh yeah, there’s one more thing I’m worried about. Do you think those tea-sipping, pinkie-pointers will let me drink coffee? I’ll send you off with some Pushing Steel. I can’t imagine them scoffing at cold brew! Hey as impressed as I am on you moving into uncharted territory I will have you know that we tea drinkers do in fact grip our mug, drinking implement, cup & saucer firmly with all fingers and do in fact tuck that pinkie in. Just saying. Whew! That’s a relief. A least I can hold the beverage correctly! Don’t know about that acid drink of your’s though. They might pull your card! Yeah, I’m prepared (or will be) to adopt the tea beverage for at least a couple of days. Transforming my usual tramp attire for something more refined might require assistance from my wife and daughters. Remember: Many a tramp wore a tweed jacket. I actually plan on going this year too! But I’ve got that whole tweed/three-speed thing all sorted out, so no biggie for me. As for “where does one find all that tweed”? My answer: Goodwill. That’s where I’ve gotten mine! And you might just find a vintage three-speed there as well, though I’m sure your local Craigslist has some there as well. (For probably less than they can be bought up here.) Though I’m sure your Quickbeam with a Sturmey-Archer hub will be just fine. Yeah, Shawn, I saw your blog post about Lake Pepin. I almost commented, but wanted to post this first. I’ll be traveling with my good friend, and occasional commenter here, Steve Butcher (GravelDoc), who did the 3-speed tour last year. We’ll look you up. It’ll be good to meet you. Pondero decides to go to Lake Pepin this year…and ponders preparations. Glad to hear the Quickbeam conversion is going well! Doing a few modifications on the Twenty, as well. Perhaps we can squirrel away a bit of java in the kit. Coming to Wisconsin, eh? If you find yourself in Madison or nearby, let me know. I’ll be riding with someone else, and am guessing we’ll be close to the river. But I’ll study the map a little and see if we have any spare time in the itinerary. Like Shawn, I get my wool and tweedy attire from the local thrift stores. If you don’t find any, send me sizing info and I’ll snag you some appropriate attire. Thanks, I really appreciate the support. Can’t wait to see your 3-speed mods. Gave you a plug on my blog. 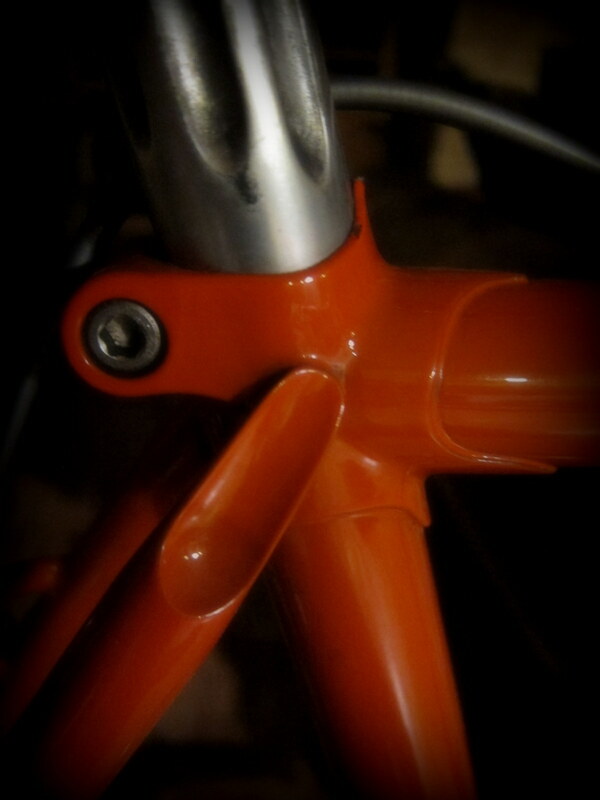 Finished changing out the bars to an Albatross. Love the color of your handlebar tape. Copied you; thanks for the inspiration. Thanks, Kellie, it looks fantastic! I hope it brings you many hours of joy.